As did many other Canadians yesterday, I too watched our newly elected Prime Minister and his cabinet ministers get sworn in at Rideau Hall. It was after all, an historic moment in our nation's history -- certainly one the Canadian public had never before been invited to in years past. 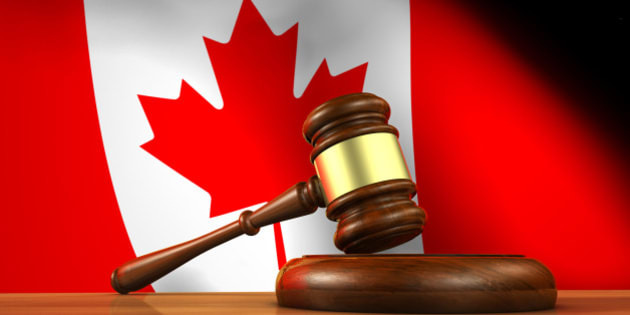 Law and justice of Canada concept with a 3d rendering of a gavel on a wooden desktop and the Canadian flag on background. As did many other Canadians yesterday, I too watched our newly elected Prime Minister and his cabinet ministers get sworn in at Rideau Hall. It was after all, an historic moment in our nation's history -- certainly one the Canadian public had never before been invited to in years past. I was curious to see which of the Liberals' 184 MPs had been selected for the coveted 30 member cabinet posts. In the days leading up to this changing of the guard, much ado had been made of Mr. Trudeau's intention for his cabinet to reflect gender parity. Everywhere I looked on my social media feed, it seemed as though everyone had an opinion about his show of support for women in the federal government. What surprised me as I took in all the comments from the tweeting Canadian masses was the glaring lack of understanding (or maybe unfamiliarity) many have about one of Canada's most important, though admittedly controversial, federal laws: the Employment Equity Act, which requires all employers (yup, the government is also an employer!) to proactively practice fair employment by increasing the representation of four historically disadvantaged groups of people, namely women, people with disabilities, Aboriginal peoples, and visible Minorities. This law, which dates back to 1986, was enacted to ensure that people were not only treated fairly, but adequately accommodated for their differences. What I witnessed yesterday, as I watched our newly elected ministers be sworn in, was a government that adhered to Canada's Employment Equity Act. Yes, this means that 15 female MPs are now cabinet ministers, alongside their 15 male counterparts. As a feminist, I make no bones about applauding this fact. We've come a long way from 1957, when then-Prime Minister John Diefenbaker appointed Canada's first (and only) woman cabinet minister, Ellen Fairclough. I will admit that Mr. Trudeau's mic drop "because it's 2015" comment when asked to explain his reasoning for his support of gender parity drew a loud, Homer Simpson-esque "WOO-HOO!" from me as I watched the media Q&A after the ceremony. So today, I tip my hat in remembrance to Ms. Fairclough, while also wishing newly selected female ministers like Catherine McKenna (Minister of Environment and Climate Change), Jane Philpott (Minister of Health), and Carolyn Bennett (Minister of Indigenous and Northern Affairs), good luck. But as a proud Canadian citizen who immigrated to this great country from Iran with my family as a young child, I also send my heartfelt congratulations to Maryam Monsef (Minister of Democratic Institutions), a Canadian of Afghan descent, who fled her homeland by way of Iran as an 11-year-old, with her widowed mother and two sisters, in search of a better life that Canada could promise, thanks to its fair employment practices. And while I may not be a member of a visible minority, my surname has always stood out during my childhood in Montreal, and my adulthood in Toronto. Yesterday, as I watched the televised swearing-in ceremony, I couldn't help but notice the MPs with similarly foreign-sounding names and faces, who have also successfully contributed to this country in important ways. I'm looking at you, Amarjeet Sohi (Minister of Infrastructure and Communities), and Bardish Chagger (Minister of Small Business & Tourism). But I'm especially applauding you, Harjit Sajjan. For those of you who don't know, our new Minister of National Defence is a lieutenant-colonel in the Canadian Armed Forces, a combat veteran, and a former detective-constable with the Vancouver Police Department. Oh, and he proudly sports a turban too. Which he even wore during his swearing in ceremony... no doubt to the gasp of former Quebec Premier Pauline Marois (she of the jaw-droppingly controversial Quebec Charter of Valuesa). The new cabinet also includes Kent Hehr (Minister of Veterans Affairs and Associate Minister of National Defence), a lawyer and active community leader who hasn't let the fact that he is in a wheelchair hold him back. And let's not forget the Aboriginal MPs who also made the cut -- especially Jody Wilson-Raybould, our Minister of Justice and Attorney General of Canada, whose résumé includes being a lawyer, advocate, and leader among British Columbia's First Nations. Oh, and she's a woman to boot, which means she checks off not one, but two boxes under the Employment Equity Act. Not bad at all. Yesterday, as I watched one minister after another being sworn in to serve in Justin Trudeau's cabinet, I couldn't help but wonder how many of them would have had this opportunity had it not been for the Employment Equity Act of 1986, which itself had its roots in 1983, when the federal government established a Royal Commission on Equality in Employment. This was known as The Abella Commission, since it was headed by Judge Rosalie Abella, who has been a veritable rock star in the legal profession over the years (she has since been appointed to the Supreme Court of Canada, becoming the first Jewish woman to sit on the Canadian Supreme Court bench). So as I sat there, in front of my television, taking all this in, I couldn't help but reflect on our shared Canadian history, as well as our values of championing historically disadvantaged groups, of which I am one. Yesterday, for the very first time, I witnessed a government that not only looked like me, but that also reflected some of the beautiful diversity that is inherently Canadian. And we owe that all to the Abella Commission, which was established in 1983 by another Trudeau. Pierre Elliot Trudeau was no doubt smiling down on us all. "Just watch me." Indeed, sir. I know I was.